littleBits Rule Your Room Kit is an electronics maker kit for kids who are interested in learning about electronics and create their own inventions. We've seen the Rule You Room kit before and included it in our electronics kits gift guide last year, but this is our first hands-on review. 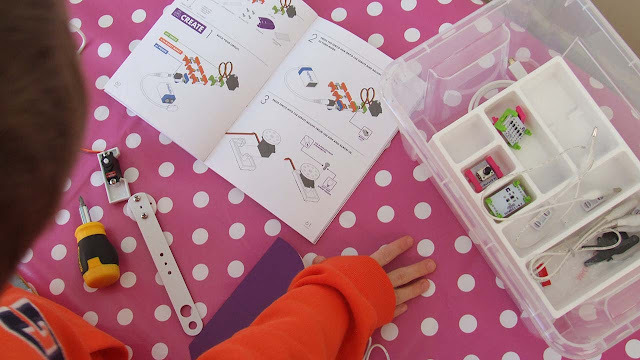 We've known littleBits for a while, here at Tech Age Kids and we've always loved their gender-neutral approach to their STEAM kits and the fact that it's reusable and the actual electronic components are exposed. Their instruction booklets have improved greatly over the years in terms of getting started with projects and packaging their bits into kits to suite specific themes or interests. Disclaimer: littleBits sent us a Rule Your Room Kit to try at home. This is not a sponsored post and as always our views are our own. 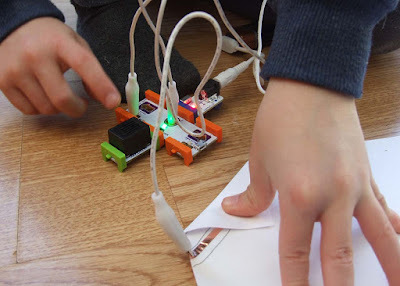 littleBits makes electronic components which snap together with magnets and are colour coded to indicate input, output, control and power components. littleBits make it accessible for anyone, including kids, to learn about electronics and how electrical components work. Enough about the box (although storing and looking after your tech is REALLY important!) what's inside the Rule Your Room Kit? Inside you'll get 7 electronic bits (bargraph, servo, Makey Makey, buzzer, sound trigger, dimmer and power), accessories (we love the awesome bits shoes!) and an Inventors Guidebook. You also get a 9V battery but it's worth having some more handy to avoid running out of power. The guidebook is packed full of ideas to get you started straight away. I loved that my 8 year old could easily read and understand it. He was able to quickly get started and make projects independently. We love the bits shoes to help keep the circuits together. Instead of peeling off the adhesive backs, we use sticky tack or tape, so they are reusable. It's worth having a small screwdriver handy to fix the servo onto a mount and the mechanical arm to the servo mount (screws are included). When we used the mounting board we found it a bit tricky to "click" the bits onto it. I had to help my son with this. You must assemble your full circuit before mounting it onto the board, but we still struggled a bit. Once it's on, it's fantastic at keeping your bits together and makes the invention more robust. The most exciting bit in the kit is the Makey Makey bit which is exclusively available in the Rule Your Room kit. This bit can turn any conductive material into a trigger for your circuit. This kit is a fantastic tool to explore conductive and non-conductive materials using the Makey Makey bit. 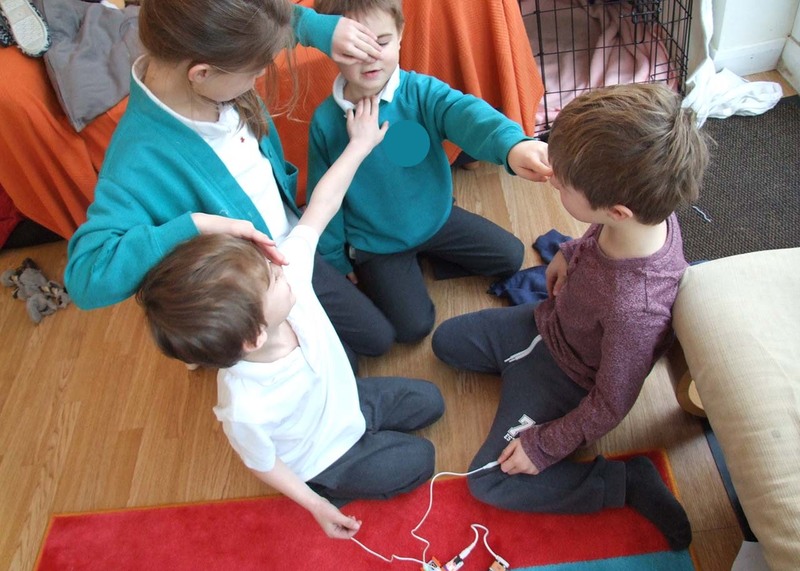 The kids had loads of fun making conductive circuits using their bodies! Every time someone closed the circuit by touching another person's nose the buzzer went off! There was lots of laughter. The Makey Makey bit can also be plugged into your computer to create an external mouse click, space bar or left and right arrows. A USB connector is included, but you still need to attached the power bit with the 9V battery to power the Makey Makey bit. Makey Makey, developed by JoyLabz, is an electronics board that plugs into a computer via USB and allows you to turn everyday objects into inputs. Learn more about Makey Makey. The Rule Your Room kit comes with 5 inventions which you can make copying the guidebook. There is lots of information about how it works and also challenges to "remix" your inventions and applying some design thinking to the projects. Everything you need to make the projects is included in the kit, apart from some household items like sticky tape, kitchen foil, scissors, elastic bands and paper. The beauty of littleBits is that the bits are reusable. If you've tried some of the projects from the guidebook, it can inspire you to come up with your own ideas. Don't forget to just let the kids play and explore, see what happens when you connect one bit to another. The magnetic connection ensures that you can't connect the circuit in the wrong direction. However be aware you are working with real, exposed electronics, so keep little kids under supervision. 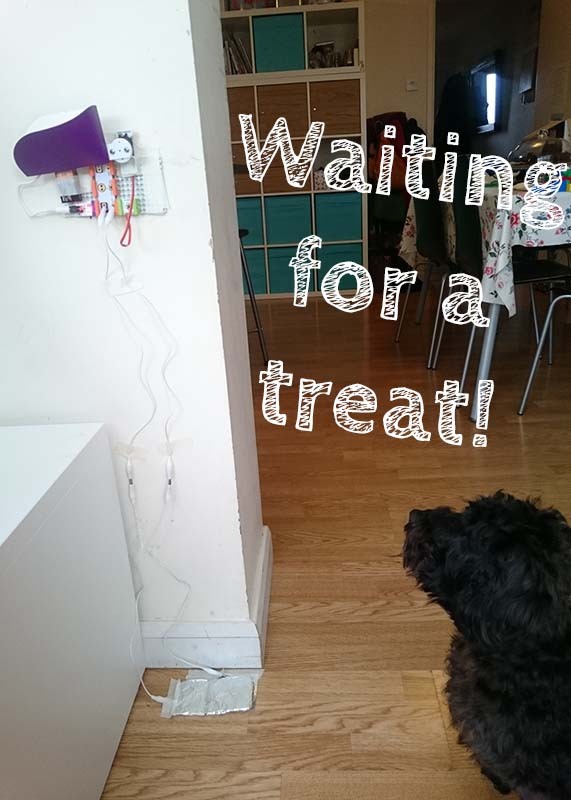 My son, remixed the "Domain Defender" project, to make a treat machine for our pet dog. Instead of attaching the invention to a stack of books, he used masking tape to fix it to the wall. He made a switch using cardboard covered in foil, which he attached to the wall at child height. 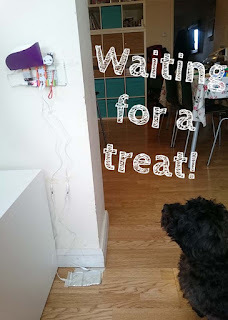 Every time he wanted to give a treat to Ruby, he would close the circuit with the switch. Ruby started to recognise the pattern and over the next few days would sit by the "treat machine" waiting. My son, then got an idea to bring the switch down to floor level, so Ruby can activate the machine herself. It proved harder than expected, and you can see our funny video of training her below. littleBits recommends the Rule Your Room kit for 8 - 12 year olds. We think that is about right for independent use, as the bits are quite delicate. Having said that, there is no reason why a younger kid can't get involved making with an older sibling or as a family. The hands-on approach is very accessible to young kids, even if they are just watching the process of making. As the electronics are exposed it's not advisable that you leave bits laying around with young kids. Hence the need for a good storage box to keep everything safe and ready for another day of making. Admittedly littleBits is not a cheap kit, but it is fantastic! We love the colours, the Invention Guidebook and the fact that everything is reusable. For a kid that is into inventing and making, you can't go wrong with a littleBits kit. Make sure you think what your kid is interested in making. Not all the littleBits kits are the same. The Rule Your Room kit doesn't have a coding element and cannot be connected via bluetooth to a smart device. If you're after programmable electronics it's worth checking out their Arduino Kit and the Gizmos and Gadgets Kit comes with bluetooth capability. We do wish they still had the magnet clasp box from previous kits, but we understand you can't have it all. Just be aware that you will probable need another storage box to keep everything together. littleBits are brilliant ready to use electronics. There is no need to phaf about with charging electronics or assembling components. You can start inventing straight out of the box! 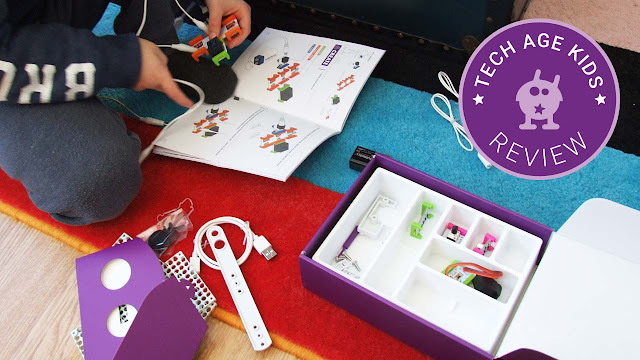 **Giveaway is now closed** We're really excited to announce our giveaway with littleBits. 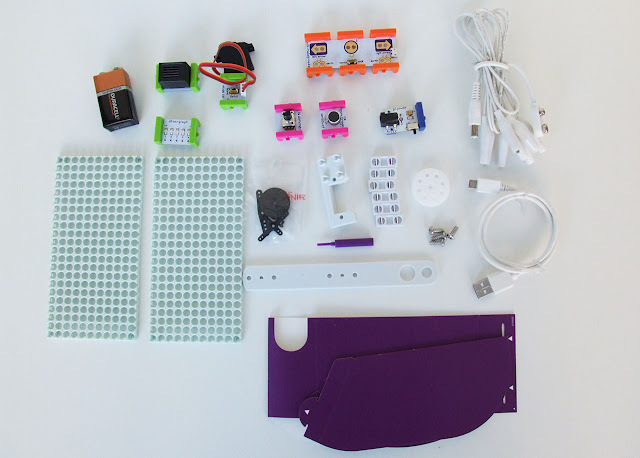 Please go to our giveaway post to enter and you stand a chance of winning a littleBits Rule Your Room Kit of your own!